Chapter 39 of the Magna Carta states "No free man is to be arrested, or imprisoned, or dispossed, or outlawed, or exciled, or in anyway destroyed, nor will we go against him, nor will we send against him, save by the lawful judgement of his peers or by the law of the land." 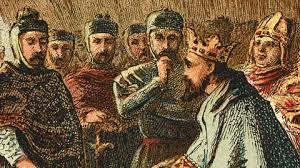 Australia's law is based upon English law which first recognised the limited power of the king over individuals in the Magna Carta which was sealed as a result of a meeting between the Barons and King John at Runnymeade on 15 June 1215. These principle form a basis for Human Rights and the freedoms enjoyed by the representative democracies that have their origin in the Magna Carta. Watch the following film from the CEFA schools resource website www.yaba.edu.au. Two Australian Human Rights Commissioners debate the need for the Racial Vilification Law 18C. This film supports the Australian Civics and Citizenship Curriculum and explores how laws in Australia can be created, debated and even revoked. This film will encourage students to think about the rights and responsibilities of citizens in the law making process and how the actions of the individual must be weighed up with the rights of the community. Tim Wilson and Tim Soutphommasane present the opposing views of whether this law is necessary. In 1215 Magna Carta gave rights to all fee men and limited the powers of the king, of course free men in 1215 refered only to those who owned land and did not extend to women or peasants. Today the citizens of Australia under the Australian Constitution and Australian Democracy enjoy freedom and rights within the laws of Australia. Discuss how rules and laws are made and how they ensure equality and freedom. Define freedom, rights and responsibilities. Why do these three terms need to be considered when rules and laws are created. In groups ask students to create a new rule or law for a group they belong to or community they live in. Ask them to present the law and explain how they have addressed the concept of Freedom, the Rights of the members of the group or community and the Responsibilities that have been considered in creating the rule or law.